This 100% natural Vitamin E supplement is an exceptional blend of health-promoting tocopherols. ** Vitamin E can support heart health and antioxidant health. ** This blend includes the important alpha and gamma forms of Vitamin E, ensuring you receive a sufficient daily supply. DIRECTIONS: For adults, take one (1) softgel daily, preferably with a meal. Other Ingredients: Gelatin, Vegetable Glycerin, Soybean Oil. WARNING: If you are pregnant, nursing, taking any medications or planning any medical procedure, consult your doctor before use. Discontinue use and consult your doctor if any adverse reactions occur. KEEP OUT OF REACH OF CHILDREN. STORE AT ROOM TEMPERATURE. DO NOT USE IF SEAL UNDER CAP IS BROKEN OR MISSING. Natural Vitamin E 400 IU is rated 4.9 out of 5 by 13. Rated 5 out of 5 by Lottie from I've been happy with this product over the years. I've had good results with your products for many years. Rated 5 out of 5 by scrcrow from Big believer in Vitamin E I have used Vitamin E for most of my life. Rated 5 out of 5 by vee17 from Excellent Products Recommended by my physician as a preventive means and it really works. It really workes and the condition never occured again. This is a testament to following directions, doing what is reccomend, and looking for desired results. 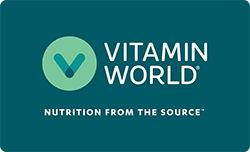 Rated 5 out of 5 by JennsDad162 from Good product at great price The reason I shop Vitamin World is there quality products that they sell at very reasonable prices. Their 2-for-1 sales are the best and I always try to stock up when they come around. Rated 5 out of 5 by BillnJanet7513 from Good Source of Natural Vitamin E Our Dr. recommends to use only Natural Vitamin E with the "d-alpha" designation. The other is man made and is not as readily absorbed into our bodies. My wife can tell the difference between the man-made and the Natural in her body. Rated 4 out of 5 by Anonymous from Been taking natural Vit E for 30 yrs+...your product meets my needs. keep coming back so it is evident your company and associates meet my needs.